I'm on a roll with comfort food. 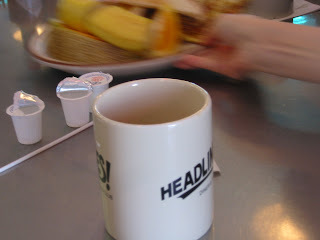 Next up, we head to our trusty ol' brunch destination, the no-frills, 50's-themed greasy spoon where portions are decidedly huge and atmosphere student-friendly: Headlines Diner & Press Club, aka. Headlines. Unless you're a truck-driver or a college student with a voracious appetite and sky-high metabolism, one order of the omelet should be enough to feed two. My favorite omelet is the healthy omelet, which isn't that healthy save for the fact that it has vegetables. It also has optional cheese that I gladly opt for. I like that a host of chopped green bell peppers, zucchini, onions, tomatoes and avocados are fully integrated into the omelet with the cheese holding everything together. Too often I have encountered omelets where the egg is separate from the filling like a pocket and everything falls out when I lift to eat it. Believe it or not, it's pretty rare to see such well-integrated omelets, even in fancy establishments. 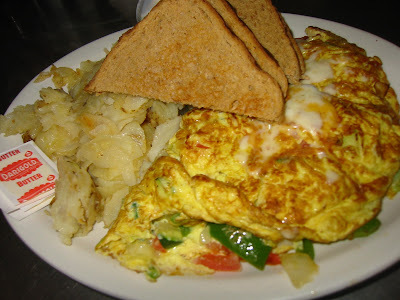 The omelet comes with a choice of toast or English muffin and hash browns or fruit. I usually get the wheat toast and hash browns (I can only do so much healthy). 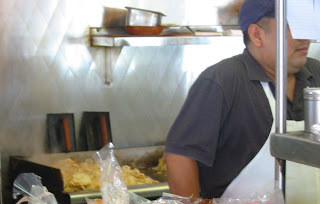 It's hard to resist the tempting pile of potatoes stacked on the griddle in the open kitchen, in plain view of customers sitting on the counter nursing their coffee. The hash browns aren't exactly the thinly-shredded-and-cooked-to-brown-perfection kind I am partial to, but they still have some brown bits and more importantly, are hearty. If you're not a butter and jam person, extract chunks of the avocado from the omelet and spread them on your crunchy wheat toast and sprinkle with some salt. It's healthier (yes, it's a theme) and so much more flavorful! In Chile, people spread palta, or avocado, on bread all the time, not to mention hamburgers, hot dogs, etc. I have tried other omelets but this one is my favorite. I have also tried the breakfast burrito, which come in two's and are appropriate if you're desperate but inappropriate if you're heading to East LA or Orange County, where you can get a better one for a fraction of the price. One thing I didn't have this day but highly recommend are the classic diner fare -- curly fries. It's spicy, crispy and plentiful. What's not to like? My companions were also seduced by the inviting look of the fries on somebody else's plate. While you're at it, you may as well try the fish and chips, which are surprisingly good. Sure, Headlines is no Irish pub. But it's decent. I wouldn't get the burger, however, which was not that different from Fatburger across the street. It gets crowded on weekends, so come before 11am and you'll be ok. I can't speak for its coffee, but I always order Naked Juice OJ, which is good enough for me. 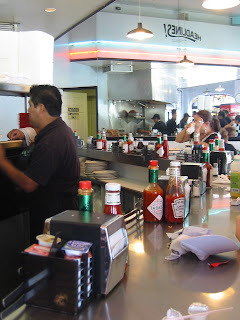 So visit your friendly neighborhood diner, sit on the counter and devour that massive omelet. Occasionally, you'll sit next to hung over kids or extremely loud kids, but they're generally innocuous. Besides, it's owned by Koreans so we support the peeps and it's run by the super-efficient and friendly Mendez brothers, who have worked there for years and love soccer. i believe i went there with you! i miss a good American omelette. you say omelette and i say omelet...you probably have. this is a must-stop for anyone staying w/us. you have a typo in your "headline" - pun or no pun? no pun! thanks for the catch. oh no, do we spell it "omelet"? i'm beginning to forget how to speak "American." if i come back talking about sarnies, rocket salad, biscuits and ask for a cuppa, please deprogram me. i meant to ask you - they don't call avocadoes "aguacate" in chile? what exactly is palta?! azinku may have a better response since she lived there longer and more recently than i have but i believe palta and aguacate are used interchangeably. check out this website on chilean avocados (http://www.paltahass.cl/html/consumers/index.htm). hilarious. they had a global convention on avocados. sounds like it's up my alley. the coffee is pretty good too and I highly recommend the burritos, much better than at McDonalds!! !